There are various ways to become a volunteer at Common Ground. See which one may be right for you! Contact Cindy DeForge via e-mail at cindy@commongroundgriefcenter.org if interested in any of the above. Volunteers are the heart of our program. Our volunteers come to us with a variety of background and life experiences. They are business professionals, homemakers, teachers, students, mental health professionals and retirees. In order to work with children, teenagers and adults in our support groups, we require all applicants to complete a 24-hour training (with a course fee). Trainings are held at our facility typically over 2 consecutive weekends. Volunteers are asked to make a one-year commitment to a support group once training is completed. Our groups meet every other week, which constitutes a commitment of 2 times per month from September to June. Groups are held in the evenings and volunteers are expected to report to our Center and be present for 3 ½ hours on their assigned group night. 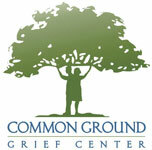 The training we provide at Common Ground is designed to teach the skills needed to provide support and care for persons who are grieving the death of someone. This training is an intense experience due to the nature of the subject matter. It incorporates many opportunities for self-awareness as it relates to one’s own personal experience with grief and loss. We accept applications on an on-going basis. Feel free to send your application at anytime throughout the year. We will contact you approximately 2 months prior to the start of the next training. The full training fee is $95.00. We require a non-refundable $35.00 deposit at that time. The remaining balance of $60.00 is due on the first day of training. Please be advised that a background check will be completed before you begin volunteering for our Center.